Yesterday we took a first look at Lightfair. Here are a few of the companies and products that caught my eye on the second day. While at first glance this product doesn't look competitive with a product such as Cree's $10 to $14 bulbs distributed through Home Depot, Switch bulbs do sport a unique feature: They are passively liquid-cooled. This means they can be used in any orientation and in fully enclosed spaces. 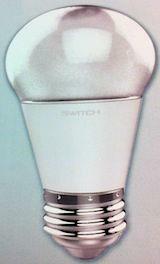 This generation of bulbs has somewhat industrial-looking heat shields, as shown. But Switch has a new line on the way this summer, infinia, that is both more price-competitive and more consumer-friendly in terms of design. 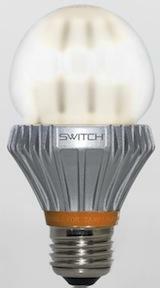 Bulbs equivalent to 40-watt and 60-watt incandescents will retail for under $20. Still passively liquid-cooled, still installable in any orientation, and cool enough to touch. This venerable chemical company won the 2013 Lightfair Technical Innovation Award for its moldable silicone product, which can be used for lenses and other light-handling elements in luminaires. The material can be formed by injection molding, compression molding, or transfer molding. Dow Corning had injection molding equipment in the booth (an SIL-PRO LSR-40A from Sodick Plustech, whose attendant said would retail for about $200,000) turning out a set of four silicone lens elements every 50 seconds. What makes this material so attractive for LED applications is that it does not discolor or grow cloudy under prolonged exposure to high temperatures and UV radiation, unlike other commonly used materials such as polycarbonate and PMMA (acrylic). Dow Corning's Kyle Hubbs told me that the company has tested the material under UV at 130°C and found the optical loss "indistinguishable from noise" after 6,000 hours. The silicone has also undergone 150°C (with no UV) for 10,000 hours and the results were the same as the above. Given that other components in a luminaire will have been certified at 105°C, it seems clear that the silicone lenses won't be what fails first in hot environments. Last week, ahead of Lightfair, this maker of LED engines using a GaN-on-Si process announced the Vero line, which introduces some innovations in packaging. One is industry-standard Molex connectors in place of wires for soldering -- so luminaires can be designed for field-upgradeability. It's one of those innovations that induce one to ask of the industry, "Why did that take so long?" Bridgelux did a favor for the entire Lightfair show floor by preparing two wall-box displays, containing colorful commercial items such as shoes and clothing, with a selectable choice of light. One display had light at 3000 CCT and 80 CRI, switch-selectable to 400 lumens, 800, 1200, 2000, 3200, or 6000 lumens. The other had constant-lumen light, selectable among 3000 CCT at 80, 90, and 97 CRI; and 2700 CCT at 90, 3500 at 80, and 4100 at 80 CRI. The former display drove home the wisdom that more lumens is not always better -- each application has an optimum level. The latter graphically demonstrated the effect of CCT and CRI on the perception of colors, especially of saturated reds and purples.